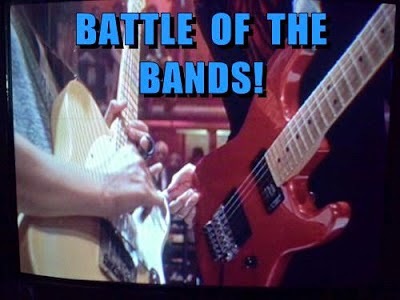 Once again it's time for Battle of the Bands. This is the event that takes place on the 1st and 15th of each month. Far Away Eyes at Far Away Series gets the credit for first conceiving this study in song version comparison. Stephen T McCarthy maintains the participant list and answers your questions about the event--you can find his blog with a list of participants at StMcC Presents Battle of the Bands. This is not at all complicated: Listen to the songs presented below and then in the comments vote for your favorite and tell us why you liked it. Then visit the links listed near the bottom of this post for more Battles to vote on. In a post from FRIDAY, MAY 29, 2015 I talked about my personal story behind my song pick for today's Battle of the Bands. The song "Cherish" was originally released by Kool and the Gang in 1985 as the B-side to the hit "Ladies Night". Sometimes referred to as "Cherish the Love" this "Cherish" is not to be confused with the song of the same title by the group The Association. To hear the original Kool and the Gang version click here, but please do not vote for this version. As I stated in my previous post about the song "Cherish", I initially paid little attention to the song when it was released. A few years later I actually paid attention to the song and the lyrics. The sentiments expressed by the song deeply touched me. Now whenever the song comes on the radio I'll turn up the volume and listen to the lyrics. This is one song that brings a tear to my eye when I hear it. I'll discuss more about this in my next post at Wrote By Rote as I present a Soundtrack of My Life post. Call me sappy or sentimental--I can be unashamedly so at times--but for me these lyrics carry such a powerful message and I absolutely adore the melody of the song. Enjoy the versions that I have to offer in this round of Battle of the Bands. This version of "Cherish the Love" is by a contemporary Christian group consisting of five brothers from American Samoa. The vocals are pretty tasty with some fine harmony and funky back-up. Get into this recording and see what you think. I've probably said somewhere that I doubted that I'd ever use a rap song for one of my Battles. That was until I found this version of "Cherish". And really this is not so much a rap song as it is a pop song with some rapping added to it. I hope you'll give it a fair listen since it's pretty soft edged as far as rap style songs go. Originally from Netherlands Antilles, Pappa Bear, with his rap hip-hop style, gives love song "Cherish" a bit of a twist. The recording didn't get much notice in the U.S. but achieved hit status throughout Europe when it was released. This is not too bad to my ears--the kind of rap I can listen to. See how you compare this to the version by The Katinas. I cherish your votes in my song version Battles so I hope you'll add yours. Which song version do you like the best? Surely you think one is better than the other even if you don't like either presentation as much as the original version. Judge what you hear in the above videos. Which version do you prefer? It's up to you to help determine the winner. Find out who gets the most votes in my post of Monday September 21st. And don't forget to drop by at Wrote By Rote on Saturday September 19th when I add "Cherish" to the Soundtrack of My Life. Are there any songs that move you to tears? Do you typically prefer sadder songs or more upbeat songs? Do you have a favorite song by Kool and the Gang? Why do people like sad songs? Katina wins for me. Not a rap fan and don't think that added anything to the song. Alex, nice and straight forward. First vote goes to The Katinas. Hi, Lee! I remember you telling us the story of how this Kool and the Gang recording grew on you. Seems it was a perfect song to accompany you on your recent trip to the Jersey Shore. I have gotten into the habit of closing my eyes or looking away in each and every BOTB to prevent the video itself from influencing my vote. When I watched the movie Spring Breakers (shot right here in my hood) for the first time two years ago, it changed my taste in music. For the first time in my life it opened me up to rap, hip hop, house, dubstep, Chicago drill, extreme heavy metal and other styles that I never thought I'd even try much less enjoy. I have tried them and I do enjoy them. That is why I am going to save you from a shut-out and vote for Pappa Bear. Call me crazy, but I love the rap and those deep beats. Shady saves the day from the git go. A vote for Pappa Bear. I thought it would be tough to top Kool & the Gang's version but I really liked the Katinas. Their version is so tight. When you mentioned rap, I thought No way would I like that version. I'm just so not into rap. But this wasn't bad at all. Still my vote is going with the Katinas. Great battle for a great song! Michele, if the rap version had really grated on me like so much rap usually does I wouldn't have used this. Tough choice. I don't like rap, I don't like the boy band sound of the Katinas, but I think they're the better of the two evils: I at least finished listening to that song while I couldn't finish the other. Madilyn, I guess The Katinas do have a "boy band" sound, but it didn't strike me quite in that way. The lesser of "two evils" is The Katinas. I actually like some rap, so that wasn't the issue. It was more that with this song the "concept" wasn't the same with the Pappa Bear version. Like many rap songs, they use a familiar chorus and then change the rest. To me, that doesn't actually make it the same song. So, my vote goes to The Katinas with the note that I would've enjoyed it more had they played to their strength (excellent harmonies) all the way through. Robin, I guess the rap versions are a twist to fit the genre. Another vote for The Katinas. The vocal tones were more pleasing to my ears. Put me down for Pappa Bear. Debbie D, I'm like you about rap, but I have heard a few rap songs that I've found to be tolerable and in some cases even good. I am with you that I don't like very much hip hop and almost no rap. There are a few songs in those genres I like, but this is not one of them. I'll admit it could have been much worse... but that is faint praise. I am afraid that this deserves to be a blowout, but you'll have some listeners prove their expansive musical tastes with a vote for P.B. I am skeptical. SBB6, I see the lyrics of the Pappa Bear rap differently than your explanation. I don't understand all the references he makes, but my take on the general gist of it all is that the narrator is still being sentimental but from the standpoint of someone culturally different. I didn't find this blatantly offensive like much of the rap I hear and this actually expresses similar sentiments as the original version though not in the same way that I would have expressed it or that moves me like the original. Some of the lines like the ones you quoted and others I found to be rather clever. I expected that this might be a blowout, but so far two voters have rescued me from that. I don't think it was a matter of having to "prove their expansive musical tastes" at all, but a matter of what appealed to their ears at the moment. More than once have I voted as such. "I don't think it was a matter of having to "prove their expansive musical tastes" at all, but a matter of what appealed to their ears at the moment." That's it, exactly! Thanks, Lee. Kudos to anyone who attempts to compete with the Kool and the Gang version! And while I don't think anyone does it better, Pappa Bear was not at all hard to listen to but The Katinas get my vote for the soothing rhythm and smooth vocals. Diedre, the original version is so good that it would be difficult to outdo it. For you it's The Katinas. I gave Pappa Bear a chance to bowl me over, but I believe the comment by Sheboyganboy VI reverberated my feelings precisely. My vote goes to The Katinas, Lee! I like how Robin described the "rap" impact on this song. I have long defended rap as a musical form (try to write a rap song-it's tough), but it is often a lazy medium, where they sample a hit (presumably for the recognition factor) and go off on their own tangent-as Robin says, it's not the same song. So, here's another vote for the Katinas-who I expect to win this by a landslide. Larry, I give credit to rappers for their skill--it's something that I don't know that I could do well, not that I'd really want to do it though. In the case of Pappa Bear I think he retains the spirit of the original song pretty well. From the outset I was expecting a landslide for The Katinas if not a shut out in their favor. I was worth a shot though since there were that many covers of this song that I wanted to use for my Soundtrack of my Life entry. DG, don't like the Association? They're great in my opinion, but I guess you must have your reasons for not liking their music. A vote for The Katinas. I feel that Sheboyganboy Six nailed it. STMcC, I didn't totally agree with SBB6's reaction, but I do have an inkling of why a lot of listeners react the way they do to rap music. I'm not generally a fan of the genre, but I do enjoy some of what I've heard. I'm surprised Stephen got through twenty seconds of the rap version....he must have walked across the room and it took him fifteen seconds to get back to they keyboard! Please place my vote for the Katinas. Like you, the other song is a rap I could actually listen to. But not for this song. As for your other questions, I do like most genres. At least I can pick out a few songs from each genre and say I actually like it. I do listen to slower or sadder songs. Usually when I'm in a depressed mood. I find it helps intensify my mood, which is when I usually write poetry, and I think I write it better then. I find it interesting that you and I agree on one thing here; the version by Papa Bear DOES bring a tear to my eye also, although probably not for the same reason it does yours. Please give my vote to the Katinas. FAE, actually it's the original Kool and the Gang version that brings a tear to my eye. The Pappa Bear version brings more like a smile of amusement. I'm not a Kool & Gang fan, however I do like this song. Serious differences in these two versions.I thought Katinas were okay, at first, but I went to hear Pappa Bear, and now I think ~ Katinas were awesome! Lovely lyrics like these deserves to be sung properly....not Rap. so you know who I vote for. I never listened to that song...i always dialed away on my radio. Nice lyrics though, but I still don't like the song. But speaking of the other Cherish, by Association, I saw David Cassidy do that in concert about 9 years ago. JoJo, when "Cherish" first came out I basically ignored it. Now I guess I'm just a sentimental old coot. Guilie, I've heard people call the song corny or cheesy. Now I'm getting hungry. Birgit, whew, that was quite a thing. The instrument to which I believe you are referring sounds like maybe a harpsichord or a synthesizer. I have an eclectic taste in music; I'll listen to just about anything. The Katinas version was good; it's somewhat similar to the original, but with a little extra something. Pappa Bear added a new twist to the song. Being from the Bronx, I like rap, hip-hop, and freestyle music. This is easy listening in terms of rap, but I liked it. My vote goes to Pappa Bear. Lilica, looks like the rap fans are coming out late at night. Cool! Another vote comes the way of Pappa Bear. I love the original of this, and I didn't think anyone could improve on it until I heard the Katinas. I didn't care for Pappa Bear's version at all, especially with the cussing and everything. The Katinas win this one for me. John, a lot of the rap I usually hear makes Pappa Bear's version sound like grade school stuff. And we're back with another vote for The Katinas. I vote The Katinas! I like their cleaner sound, much more appealing. I vote The Katinas...they do have a bit of the boy band sound, in a way that I enjoy. Joyce, "boy band" did not come to my mind, but now that it's been mentioned I guess they do have that sound. But of course they are "boys" so why wouldn't they? My vote goes to the Katinas! Thank you so much for your visit and kind comment on my blog today. Please know that you are welcome anytime! Linda, sorry I don't get around more! I think SB6 made a valid point, but fortunately for Papa Bear I tend to turn words I can't understand into one more instrument. And so the "instrumentation" of the second gets the nod over what I perceive to be the bland vocals of the first. CW, at least this contest didn't turn out to be the absolute shut out that it could have been. I was so happy to see your visit Lee. Thank you. I have missed you. I am stumped as to who to pick. I never was a Kool and the Gang (more like a Led Zeppelin fan) fan. But this is THE song they did that I truly loved. I am NOT a fan of rap either. I enjoyed listening to The Katinas. Robyn, I've slowed down so much with visiting over the past few months and now I've been trying to catch up with a lot of bloggers. Got you for The Katinas. Mike, thanks for you vote for..
A tough choice, as both versions are very well done. I remember the Kool and The Gang version, and Kitana stays true to the original. They do harmonize well. I think I'll vote for Papa Bear though. I'm kinda in the mood for something different I guess. While I'm not opposed to rap, can't usually listen to much of it, except when it is coupled with some pop or country. Linkin Park is one of my fav groups after all. I'll vote for Papa tonight. Just the right vibe, and I did appreciate the changes to the lyrics. Well done. Dolorah, when the mood strikes, follow it. You're in the mood for Pappa Bear. Wait, don't close the polls yet! We're fashionably late but still here. Don't tell anyone, but we like a bit of rap. Pappa Bear's version kinda misses the mark, though. His rapping isn't particularly spectacular, and it doesn't really add anything to the song. I'm not exactly fond of the Katina's version, but I would call their version better. Another vote for them.